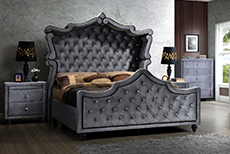 When the owners of Homelegance furniture were deciding on a name for their company two decades ago, they made the right choice with ‘elegance’. There is nothing quite like their fantastic assortment of home furnishings. Classically styled, luxuri View more ous, masterful, breathtaking – one could run out of adjectives! These pieces need to be seen to be believed or even better, brought home to enjoy! When the owners of Homelegance furniture were deciding on a name for their company two decades ago, they made the right choice with ‘elegance’. Th View more ere is nothing quite like their fantastic assortment of home furnishings. Classically styled, luxurious, masterful, breathtaking – one could run out of adjectives! These pieces need to be seen to be believed or even better, brought home to enjoy!